Recently South Central rapper Figg Newton dropped the music video for his song, “Been Been Brackin” Ft Big Wy. The single brings together the two well-respected street rappers for a song anyone in the streets can appreciate. “The track was produced by L-Finguz out of Sacramento, CA who won Producer of the Year by Thizzler and he’s been setting the West on FIRE!” Figg Newton said. 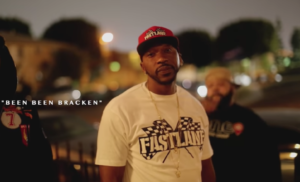 The L-Finguz produced track comes along with a clothing line called FastLane that’s being released along with his recent string of video releases highlighting his South Central neighborhood. The new song is housed on the new compilation The Woop Vol. 1. which is now available on all digital platforms showcasing talent in Figg’s community. Despite his clear affiliation with South Central gang culture, Figg Newton is moving toward guidance and a positive message in his music for those that are caught up in the gang life needing inspiration. In the Steezy Shotz directed visual, you can see Figg Newton doing his dance and Big Wy is posted up with his crew scoping the block. This visual is South Central LA to its core and if you love the West-Coast this is def worth the spins.